Powerful and riveting - a fantastic and equally enraging story that benefits from not just the material, but the exquisite cast led by Michael Keaton, Mark Ruffalo and Rachel McAdams. Along with The Big Short, probably equally as an important film from 2015 that exposes some harsh truths that could have remained buried but for some intrepid minds. I unexpectedly cried at the end of this movie. Don't know how you could feel good about being a catholic. Spotlight is a tremendous piece of film making that will make you go completely speechless with some of the scenes in this movie. Michael Keaton, Brian d'Arcy James and Rachel McAdams all gave superb performances, as it was both convincing and realistic with their reactions. But Mark Ruffalo was absolutely phenomenal in this movie and he stole the show. The director of this movie (Tom McCarthy) did the Adam Sandler film "The Cobbler". Now, let that sink in for a minute. "They knew and they let it happen! It could've been you, it could've been me, it could've been any of us." After watching "Concussion", I wondered how former NFL players would react to this film. After seeing "Spotlight", I asked myself whether the clergy had the courage to see this film or not. And also if lessons were drawn from this. Would the Church restore his original role in society? A haven for believers. Its function as middleman between the divine and the Christians. An institution created as a service for the needy, poor and pious. Or would abuses such as addressed in "Spotlight" simply continue to exist? Because lets admit it. The credits at the end of the film are more horrible than the actual film. It shows that the cited case is only a tip of the iceberg. This dramatic recreation of the Boston Globe's investigation of child abuse within Boston's Catholic hierarchy is at once an unsettling but also inspiring motion picture. Unsettling because the tragic details of the case. But also inspiring because it champions inquiry and perseverance in the pursuit of justice over ignorance and persuasion to protect the guilty and the corrupt. Spotlight has a great story at its disposal but it would only be suitable for an extra long episode of 60 Minutes or a glorified TV movie without the strength of its powerhouse cast. They're all great in their roles. Spotlight was one of many great films that came out in 2015 but that does not negate its excellent acting and storytelling. As far as Best Picture winners go, it's a good choice. No posts have been made on this movie yet. 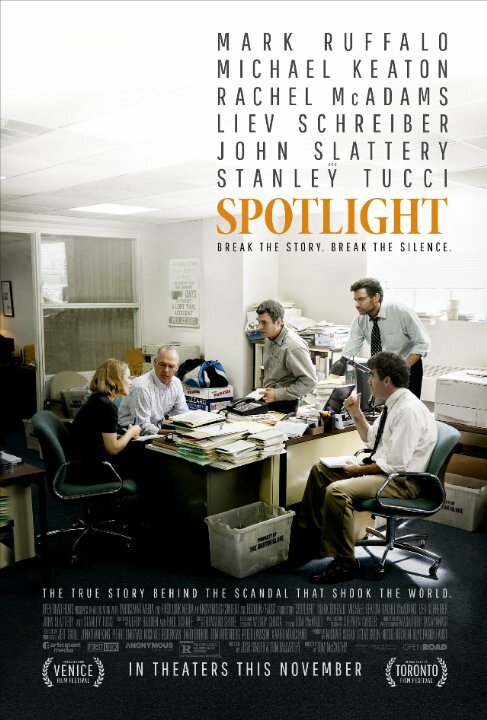 Be the first to start talking about Spotlight!